You can partner with the Coastal Bend Bays & Estuaries Program to create a legacy that will have a lasting impact on the future of the bays and estuaries of the Coastal Bend. We offer a range of planned gift options to help ensure that our donors find the right match for their resources. We will work with you to create a charitable legacy that supports our shared goal of protecting bays and estuaries. 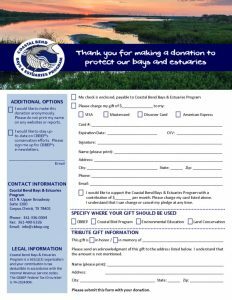 A gift of cash or securities in your will or living trust is a simple and rewarding way to support the Coastal Bend Bays & Estuaries Program. It has no impact on your current lifestyle and can be updated at any time. When making a gift, you can list a specific amount or a percentage, as some people find it difficult to predict the final value of their estate. Making an unrestricted gift will allow us to use the donation for our most pressing needs. However, we will happily discuss any specific wishes you may have for your gift. A gift of retirement assets (401K, IRA) is one of the most tax efficient ways to make a charitable donation. When passed to heirs, retirement assets may be subject to both estate and income taxes. When you name CBBEP as a full, partial, or contingent beneficiary of those assets, we receive the full amount of your gift, tax-free. Another option for individuals over 70 ½, is to make a direct contribution of up to $100,000 each year from an IRA to a qualified charity, tax-free. This allows you the enjoyment of making a difference during your lifetime, while meeting your annual mandatory distribution. For both types of gifts, contact your retirement plan administrator with CBBEP’s contact information and tax identification number 74-2924909. You can use life insurance assets to make a contribution to the Coastal Bend Bays & Estuaries Program. The simplest method is to name CBBEP as a full, partial, or contingent beneficiary of your policy. You retain full control of your policy and any value it accrues. To make this gift, contact your insurance company or agent to complete a beneficiary designation form. You may also name CBBEP as the owner of a life insurance policy during your lifetime. This allows you to receive an immediate income tax charitable deduction for a portion of the policy’s face value. There are several ways that gifts of real estate can provide meaningful support for the Coastal Bend Bays & Estuaries Program. We welcome discussion about specific wishes for your property and list several options for gifts of real estate below. An outright donation provides you with an immediate income tax charitable deduction equal to the property’s current market value and eliminates capital gains tax, securing the full value for use by CBBEP. This is a great way to support to support CBBEP’s work in the future, while retaining control of your property during your lifetime. In certain circumstances, CBBEP can purchase your property directly for a deeply discounted price. This provides you with an income tax charitable deduction equal to the difference between the property’s appraised market value and our purchase price. This type of donation allows you to make a gift to CBBEP while receiving cash for other purposes. When CBBEP acquires a property, we accept the responsibility to maintain and steward the property. For that reason, we carefully evaluate each property on a case-by-case basis to ensure the property supports our strategic goals. To discuss options for gifts of real estate, contact Jake Herring, Director of Land Conservation and Stewardship at 361-336-0309 or jherring@cbbep.org. To discuss what planned giving option may be right for you, contact Kiersten Stanzel, Director of Partnerships at 361-336-0315 or kstanzel@cbbep.org. The Coastal Bend Bays & Estuaries Program cannot render tax or legal advice. Please consult your attorney or professional advisor about your specific situation before making a charitable gift.